Imagine being diagnosed with cerebral palsy, more specifically spastic diplegia, and still having the heart to pursue the things you love. East senior Alex Vickney has done just that. Spastic diplegia is a neuromuscular condition of increased rigidity, tension, and spasticity in the muscles found in the legs and hips. “My balance is really poor. My hamstrings and calf muscles get really tight especially when I grow because the bones will grow, but the muscles won’t grow with the bones. Anything with lower body I tend to struggle with,” Vickney said. The condition not only affects Alex on the lower half but upper body as well. “Sometimes it will affect my hands, too, especially my grip. My nerves in my brain cannot tell the nerves in my legs to relax, so my muscles are usually tight all the time,” Vickney said. Ever since he was a little kid Alex has overcome his physical obstacles on an athletic level. “When I was younger I did just about everything. I did soccer, baseball, basketball, swimming and flag football,” he said. Alex’s passion for athletics carried on into high school. “I managed the football team for four years. Sophomore year I was a manager for the wrestling team,” Vickney said. 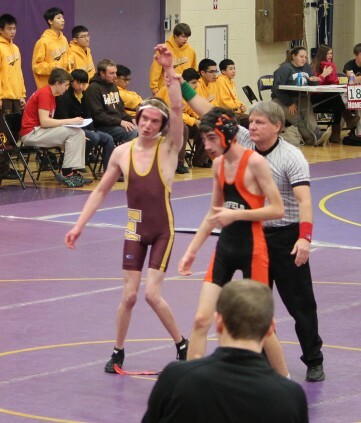 Alex fell in love with wrestling and decided to participate junior year. “Who really influenced me in terms of wrestling was former East coach James Gundrum. He persuaded me into going out for wrestling and I thought, ‘why not’,” Vickney said. Like any new sport, trying wrestling for the first time proved difficult. “It was tough and I was on JV, which I was okay with just so I could get some more experience down. And this year, regardless of my record, it has been a lot of fun. Hanging out with the guys and going to a bunch of tournaments is a blast,” Vickney said. Alex has been involved in sports his whole life and plans not to get away from them. After high school Alex plans on going to UWWC for two years and then transferring to UW-Parkside for sports management. Alex is one of three children of Gretchen and Travis Vickney and the only boy. Gretchen and Travis also have two daughters, Ashley, who is 20, and Abby who is 13. “My family has really supported me a lot,” Vickney said.